I flew into Tagbilaran, Bohol for just a few hours yesterday, to take care of some family business. But after my meetings were over, I managed to fit in a terrific lunch in the city, made a quick run to my favorite artisanal broas bakery, and a quick dash to the Dauis church to see for myself what some impressed locals said was the handiwork of some generous and concerned conservationists and donors… It seems Bea Zobel, Jr. and the Ayala foundation are assisting in the restoration/renovation of the convento which had fallen into serious desrepair, beside the Dauis church. So far they have fixed up the first floor of the convento, and a small but chi-chi gift shop has opened with tasteful mostly locally crafted items. But the gem so far is through the doors and out back near the water’s edge… this century or more old acacia tree. It was FABULOUS. Those of you who have read this blog for the past few years would have noted that I have an absolute soft spot for fantastic large trees, and I am always awed when I come across a wonderful tree on a provincial roadside, hacienda, farm or home. This is beautiful! 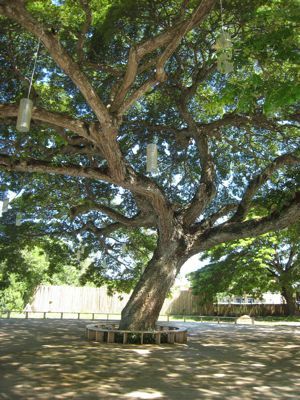 I remember we had a really old and gracious accacia tree in our campus at the old St. Theresa’s College in San Marcelino St. [I believe it is now Adamson Uni campus?] Lots of fond memories made under that tree! Seriously, thanks for writing about a variety of topics that give insight about the simplest of pleasures to the more “extravagant” ones. I graduated from a school with big old trees and grassy lawns. What I lament the most is that newer schools now are mostly concrete, very little, if any, grassy playgrounds for the children. My mom is from Duero, Bohol and so I am always interested with everything that has to do with Bohol. Dauis Church and this gorgeous wooden terrace will definitely be in the itinerary the next time I go to Bohol. Hopefully by that time, that coffee shop you mentioned will be open already and I can have a cup of coffee or hot chocolate under this magnificent tree! I too love big trees. Our house along Shaw Boulevard is shaded by one of the largest (if not the largest) Narra tree along Shaw. During our vacation, I just sit in the veranda and just look at its shade, specially when it rains. I love acacia trees. They are so elegant…. so majestic. what a beauty to behold, that tree! i can imagine a banda or a rondalla playing under it’s shade on a balmy sunday afternoon as the community gather around and have a merienda of sorbetes and turon. my perfect kind of a lazy sunday afternoon before going back to the fast paced life in the city before monday morning. I miss those large acacia trees. While in colege, my friends and I like to sat on benches under huge acacias. Sort of tambayan but somehow we feel sleepy every time. Must be casting its spell on us every afternoon. This tree reminded me of the famous Banyan tree in the middle of downtown Lahaina in Maui. This old tree is over a hundred years old but its broad leafy shoulders continue to provide shade to weary tourists and home to countless birds. This is the perfect picnic tree. I love Bohol! It’s truly beautiful. i like the acacia trees somewhere in the highway at tanjay, negros oriental. i like huge trees, banyan, acacia, dapdap, and other nameless tree species that provide shade and shelter for creatures. I think big, old trees should be marked national heirlooms nowadays. They have survived! I haven’t been to Bohol even if I had been to most parts of our country. Hope I get to see that acacia tree too, MM! I’m glad to see we’re back in good old PI. I love trees of all kinds–they’re like old friends… I also lament that there is a real lack of a variety of trees for beauty and local lumber use, and that all the valuable trees are shipped out for export. What happenened to all the government tree planting efforts of the eighties? In the province it seems up to the individual towns to decide whether to plant trees or not. There was once a conceit among certain newly moneyed New Yorkers to acquire bare land and transform them overnight into venerable country estates by planting forty year old trees. Did not take long however for someone to comment that thatâ€™s how God would have done it, if he had the money. I think it amusing that I find myself visiting your blog site more and more often whenever I need something good to read. I’m not the “blogging” type– don’t have the time to waste. But your good eye and fine narrative skills make for an irresistible “journal” read, or a good “traveller’s tales” account, at best– one that informs well, and entertains. Vicarious travel throughout the archipelago has never felt/tasted better. WOW!!!!…. the first things that came to mind while viewing the pictures (before reading your blog) was that it was a perfect setting for a reception or an al fresco cafe…and here you are talking about the same thing! Now the family has another reason to cross-over to Bohol for the day!! Thanks MM! I too am enchanted by big trees…I remember having dinner under big acacia trees in the town plaza just outside vigan about 10 years ago and it was awesome. There is always something really soothing and calming about admiring at tall trees..Acacia being somewhat of an old story teller and protector from the scorching heat ..if only it would talk! I, too have memories on big trees. When I was still in Pampanga, we lived in front of a military camp and there was a massive acacia tree that I couldn’t help but admire. Memories of Mt. Pinatubo eruption goes with it as well because I still remember how mightily it stood amidst all the heavy ashfall that fell on it. I love trees myself. And acacias with their widespread canopy of branches always brings back memories. In our small field in poveda, there was this big old acacia with big roots that we used to sit on and we’d spend after-class hours under its shade. MM, seems your not alone. I love big old trees too! They seem so grand and majestic, these wonderful works of Creation draw you to them and you really cant help but be awed by its immensity and beauty. You are right, they inspire the intellect as well as the soul, too bad most education facilities (public schools)do not have them anymore except for the established privately run schools. I’m pleasantly surprised you are into architectural conservation! We really need to conserve, preserve and maintain our very rich colonial architectural heritage, too bad there has really been no concrete effort for it. I could go on, but it would be off-topic already. Anyway, I hope more people like Mrs. Zobel would help spearhead the conservation of the church. dizzy, there’s lots of us oldies here who love big old trees! I love the rows of huge acacia trees in UP. MM, have you ever seen a full grown baobab? Never fails to elicit a sudden yearning to hug the tree. How do they treat the flooring in that Dauis terrace to preserve the wood? Aaaww! My friends and I have just been to Bohol receently (hehehe,played hooky actually) and while we did the nice touristy itinerary, we surely missed out on this one. Ha! Nxt time for sure, I will be having coffee near this magnificent tree! WOW! its really gorgeous,thanks for the information about that amazing tree. you must visit this big accasia tree of dauis bohol. i assure all of you that,the place mentioned is so nice and beautiful…hehehe. Cafe Lawis is now open at the ground floor of the old Dauis convent, but you may choose to sip their magnificent coffee under the equally magnificent acacia dock which is formally called Terraza de Mariveles, named after the two date palm trees which tradition says marked the spot where a miracle of Our Lady of the Assumption took place a couple of centuries ago. The best time to enjoy Terraza Mariveles is towards sunset when the entire place transforms with the magic of nightfall. don’t fail to visit this place. Your food gets tastier when you know part of the proceeds here goes towards the preservation of Dauis’ priceless church heritage. 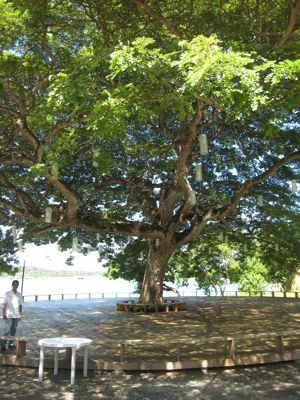 We were just in Bohol last weekend and had the opportunity to have refreshments under this marvelous tree. It truly is amazing! 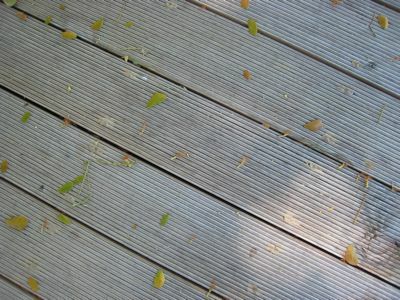 We were told the teak deck cost 5M each (there were 2 of them already). The whole area begs for a wedding reception!